TechPowerUp reports an infographic from AMD Korea reveals details about the performance of the A10-4600M, an upcoming 32nm Trinity APU. It has four x86-64 cores spread across two "Piledriver" architecture modules, 4 MB of total cache (2x 2 MB), CPU clock speeds of 2.30 GHz (3.00 GHz TurboCore), and integrated Radeon HD 7660G graphics that has 384 VLIW4 stream processors, and GPU core speed of 685 MHz. The chip integrates a PCI-Express 2.0 root complex, and dual-channel DDR3-1600 MHz integrated memory controller. 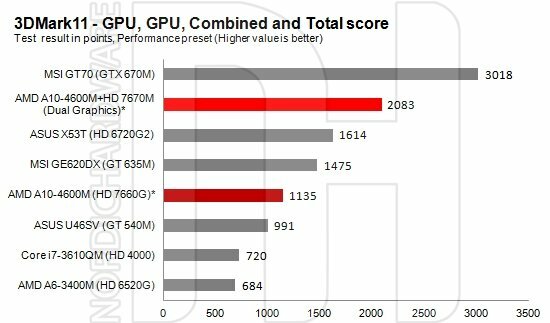 CPU performance isn't mentioned, instead AMD focuses on GPU performance.